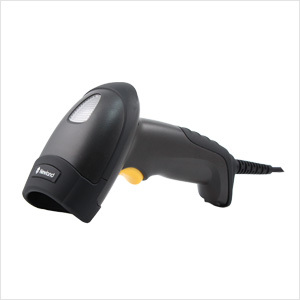 The NLS-HR1550-30 hand-held barcode scanner (corded) is able to read 1D symbologies as well as PDF417 and MicroPDF417. Thismodel supports standard RS-232, USB, PS/2 PC interfaces. With good performance, this rugged and compactscanner is very suitable for various applications such as supermarkets, shopping malls and warehouses. Supports common 1D bar codes and PDF417 and MicroPDF417stacked 2D bar codes. Supports RS-232, USB, PS/2 interfaces. Easy to hold regardless of hand size; reduces fatigue; enables users to scan bar codes comfortably to increase productivity in scan-intensive applications. save check-out counter space and reduce transportation cost.